Chennai, India is a part of the Logistics Plus® network. This office provides air and ocean freight forwarding, inland ground and rail, warehousing and distribution, project cargo, import/export, and global trade compliance services. The city of Chennai lies on the east coast of India. IT and business process outsourcing compose a large segment of its economy. It is also a center of India’s automobile industry, leading it to be called the “Detroit of India”. 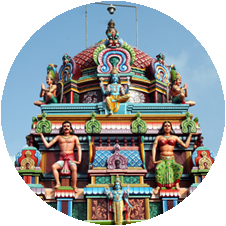 Chennai is the home to the headquarters of the Southern Railway, along with two railway terminals–Chennai Central and Chennai Egmore. Chennai International Airport serves the city’s transportation needs as well, with 24 cargo carriers. In addition, Chennai has not one, but two ports–Chennai Port and Ennore Port. Yearly, the Chennai Port moves 61 million tons of cargo, while the Ennore Port moves 11 million tons of cargo. Chennai is also home to a Logistics Plus office where we proudly serve both small and large businesses throughout the region. At Logistics Plus, we are more than just a local logistics company – we are a team of talented and caring professionals that share a passion for excellence, service, and community. Whether it is working as your 3PL or 4PL partner, our services include total logistics management, air and ocean freight forwarding, inland ground and rail services, project cargo and project management, import/export services, warehousing and distribution, global trade compliance services, and logistics and technology solutions. If you’re located in Chennai, or any other surrounding community, your friends at Logistics Plus are ready to provide you with local, domestic, and global transportation and logistics services. Additionally, we’ll show you how our people in India put the “plus” in Logistics Plus by doing the big things properly, and the countless little things, that together ensure complete customer satisfaction and success! Logistics Plus India Pvt. Ltd.